With Lesley-Ann Brandt, Lucifer lead actor Tom Ellis gets his first prominent support at MagicCon 3 from his circle of colleagues in the success series of the same name. The actress of South African descent is Lucifer’s best friend in the role of the demon Mazikeen and works in his nightclub Lux in Los Angeles as a bartender. Maze has been loyal to her diabolical boss in hell for a long time and spent his time torturing the souls of the deceased. She was also the one who – at his request – trimmed his wings … or rather cut them off. Apart from her demonic role (which she has played since 2016), Lesley-Ann Brandt has appeared as a guest in Legend of the Seeker and in a recurring role as Naevia in the TV series Spartacus and the mini-series Spartacus: Gods of the Arena. Her other series credits also include appearances in The Quest. 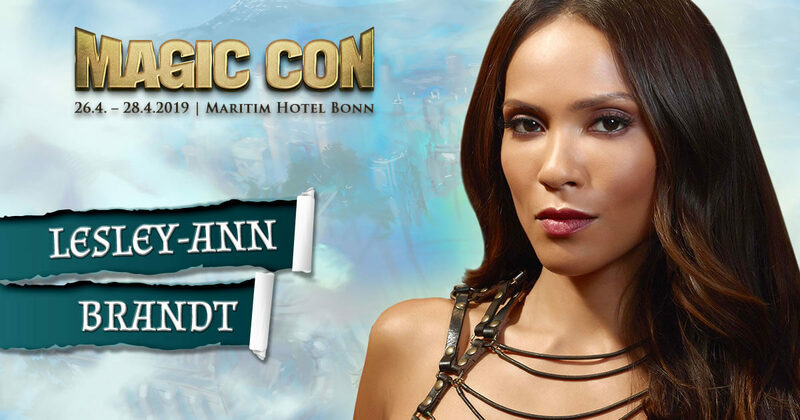 Lesley-Ann is looking forward to meeting her German fans at MagicCon in Bonn and of course to seeing her smart colleague Tom Ellis again. You can already get autograph and photo vouchers for both stars in the Ticket-Shop.